The Slough Jets conceded an early goal but once equal never looked back at they took the lead in the season series over Guildford Flames. Milos Melicherik found the back of the net just 35 seconds into the game but Dan Scott scored a powerplay goal at 6.09 that levelled up the scoring. Darius Pliskauskas made it 2-1 58 seconds later and that was quickly followed by Ciaran Long securing 3-1 at 10.41. When Matt Towalski scored at 11.31 to make it 4-1 Guildford took their time-out and replaced James Hadfield with Mark Lee in the net. Milos Melicherik made it 4-2 with 59 seconds left in the first period but the opening 20 minute honours went to Slough. The scoring slowed in the second period but the intensity didn’t. Both teams fought hard and Pliskauskas netted his second at 30.57 but Stuart Potts kept the margin the same heading into the second interval with the 3rd goal for Guildford. Both teams continued pressing hard in the final period but the netminders shut the door on all but one attempt at Mindy Kieras snapped home a powerplay chance at 44.48 to make it 6-3 which remained the score until the final buzzer. 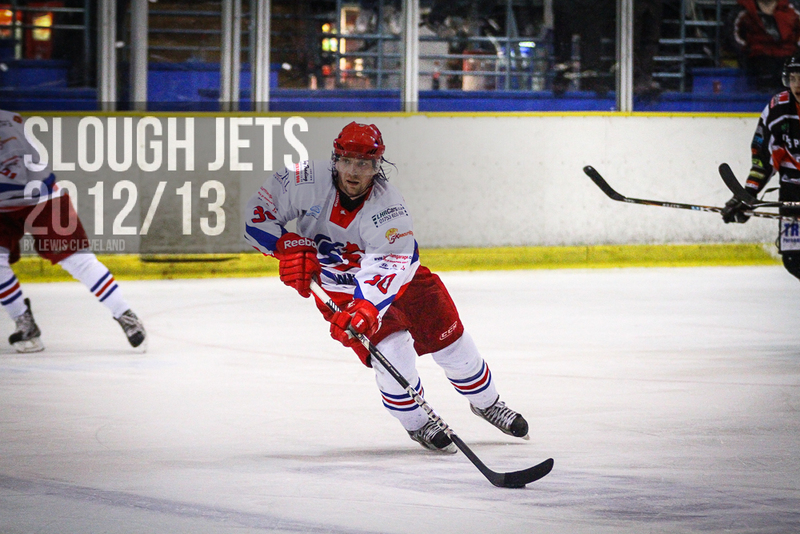 Slough Jets started a home and away weekend with the Telford Tigers playing host at the Hangar missing players to injury and GB Under 20 duty. It took 9.49 for the home team to open the scoring when Frantisek Bakrlik netted the first goal and he doubled up at 15.43 for the second goal, ending the first period 2-0, Telford killing off both penalties they collected in the opening period, but with 55 seconds remaining of the second carrying into the second period. Back out for the middle period Slough’s captain, Michael Wales, scored a powerplay goal on the remainder of the opportunity to make it 3-0. 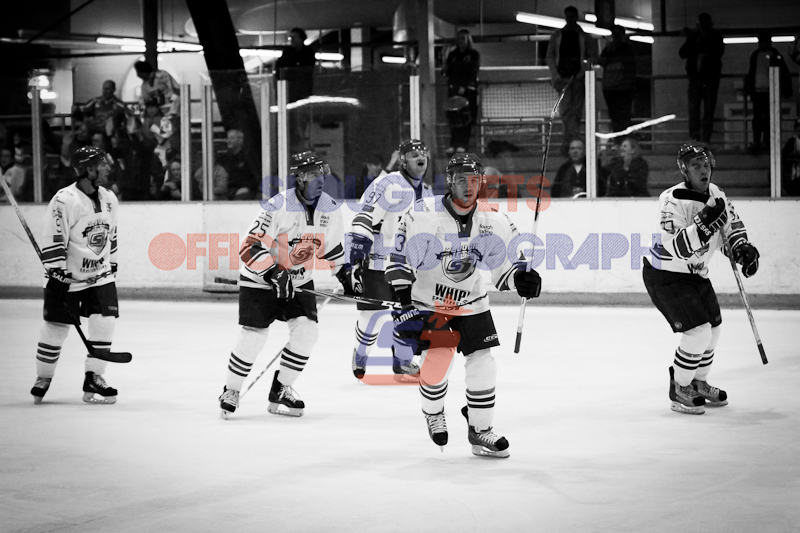 Dan Davies then scored Slough’s fourth with a shorthanded goal at 31.39 and the period ended 4-0 in favour of the home team. Slough changed netminder for the third period with Danny Milton taking over and facing a penalty shot just 54 seconds in. Patrick Greene scored the penalty shot but then Slough put the game beyond any doubt with four goals in 8½ minutes. Darius Pliskauskas scored at 45.03 and at 49.48 Dan Rose scored his first senior goal. Tomas Valecko made it 7-1 at 51.42 and Matt Towlaski scored Slough’s final goal at 53.29 to make it 8-1. 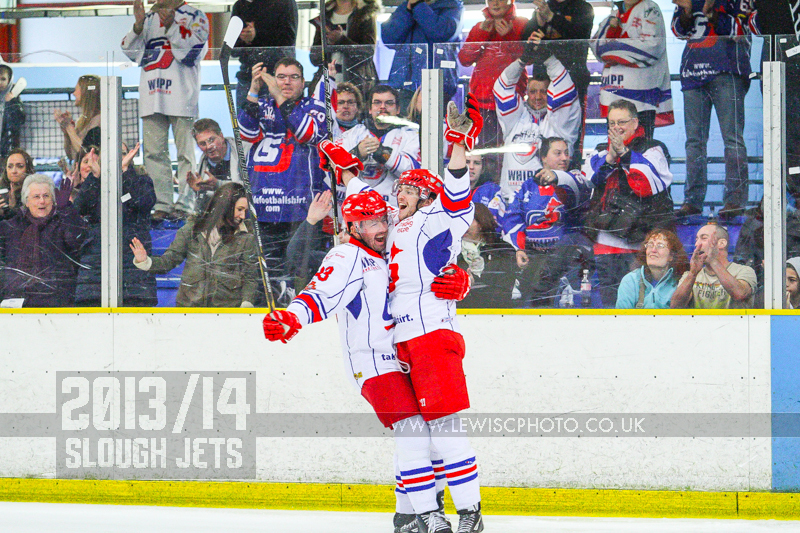 Tomas Janak netted the final goal of the game at 55.46 to make it 8-2 but Slough had already secured their points. 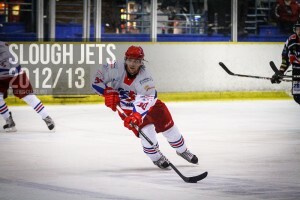 Slough Jets had home ice advantage for the opening clash in a home and away weekend series with the Sheffield Steeldogs. It took 2.20 for the game’s first goal to be scored as Sheffield grabbed an early lead through Ashley Calvert. The home team the killed off a penalty and later Joe Greener levelled up the game with his first of the night at 12.31. Slough proceeded to kill off a second penalty and the period ended 1-1. The middle period saw the home team open a lead with two unanswered goals. First was a powerplay goal from Joe Greener at 24.13 and Darius Pliskauskas added the third at 33.51. The visitors pulled the game back at 45.25 with a delayed penalty goal from Pavel Gomenuik but Dan Davies made it 4-2 at 47.35. Andre Payette called the visitors time-out at 49.31 and Calvert then scored his second, making it 4-3 at 54.57 prompting a tense finish. Ben Bowns left the Sheffield net but Joe Greener seized on the empty net situation to grab his hat-trick at 58.42. Bowns returned to the net but with no further scoring Slough collected two points with their 5-3 win. 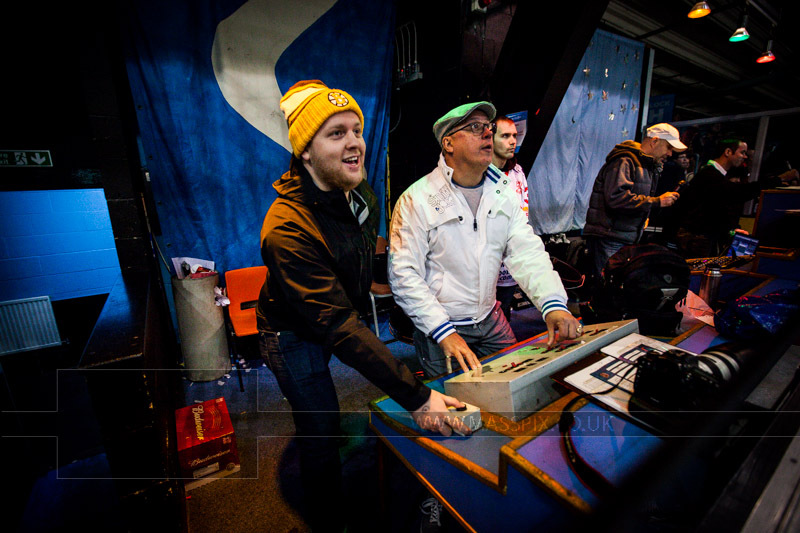 Despite a week of poor weather the weekend improved and the Manchester Phoenix made their way down to face the Slough Jets at the Hangar. Manchester Phoenix took the lead with 8.23 played when James Archer found the back of the net. The visitors then took a penalty but killed it off and kept the score 0-1 in their favour until the interval. Slough pressed their visitors hard in the second period and after killing a penalty off they then equalised the game with 35.32 played when Slava Koulikov scored the game tieing goal. Both teams played a high paced third period and both netminders made some great saves but the final 20 minutes failed to separate the teams. Four on four overtime also failed to separate the teams and it came down to penalties. Slough elected to shoot first and Koulikov and Pliskauskas scored for the home team while Huppe and Wallace both failed to score for the visitors and Slough took the winner’s point. Planet Ice Milton Keynes played host to the Lightning vs Slough Jets EPIHL game with Slough leading the season series. The home team came out hard and dominated the shooting in the open period. Monir Kalgoum opened the scoring at 7.03 but Peter Poljacek levelled the game at 13.43 soon after the home team had killed off a penalty. Back out in the second period Slough reversed the shot advantage and pressed their opponents but a 2+10 penalty to Joe Greener saw Andre Smulter score and give the home team back the lead. Adam Greener picked up a 2+10 penalty identical to his brother’s earlier penalty at 27.16 but this time the advantage was killed off as did Milton Kenyes when Ross Bower collected a 2+10. Adam Carr picked up a late penalty and just 6 seconds in Dan Davies had converted the advantage and the teams took the interval tied at 2. Shot advantage swung back to Milton Keynes in the third period and 8.36 in Michael Wales scored the game winning goal. As time ticked away Peter Russell called Slough’s time-out with 2.23 remaining but even with 9 seconds of empty net they couldn’t equalise and MK took the win.